Traditionally, a popular spot for Oktoberfest celebrations, Löwenbräu Keller has it all and to really make the most of your time here. Try the large-portion Bavarian Cuisine meals, watch and listen to the Bavarian entertainment and most of all, enjoy the cultural experience in what is possibly the biggest restaurant you’ve ever seen! Must Try Dish: The epitome of Bavarian food is of course, Leberkäse, a beef loaf made from finely ground corned beef, pork, bacon and onion. Despite the name, the dish contains neither liver or cheese. Here, enjoy this traditional dish along with two fried eggs and potatoes. We guarantee you will love it! 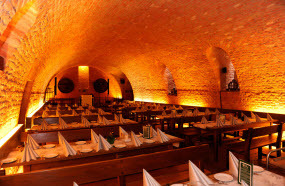 Situated in a gorgeous building, Weisses Brauhaus is a local beerhall and restaurant, frequented by locals and tourists alike. 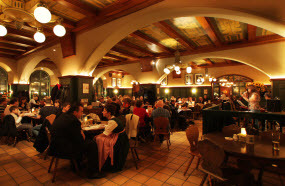 With a more mature setting than most other beer halls in Munich, you can enjoy a lovely Bavarian meal and beer in a atmosphere more suited to your likings. Must Try Dish: A traditional Bavarian meal that you won’t find in many other cities, Pork Knuckle is one dish you must try! The knuckle is marinated for up to a week before being roasted and serve fresh to your plate with Potato Dumplings, you can’t go wrong. Centrally located in the heart of Munich’s Old Town, you will find Ratskeller, a restaurant that resembles more of an extravagant monastery rather than anything else.Gasp in the glory of the stain-glass windows, mahogany-lined ceiling and beautiful wooden furniture. An added bonus; it’s not as expensive as it appears! Take a wonder around the building to really appreciate the amazing architecture. 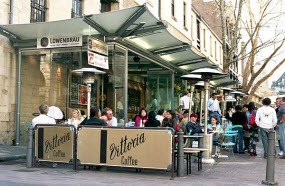 Must Try Dish: One cannot possibly leave Germany without trying a Weiner Schnitzel (Weinstruben schnitzel), a traditional German schnitzel made with pork. Your schnitzel would not be complete without the complimentary chips and lemon of course. One opportunity you don’t often get is to drink the same beer, in the same location the royals did! Back in 1589 Wilhelm V, the Duke of Bavaria decided to build his own brewery, to honour the drink he loved both morning and night; beer. Today you can gasp in the glory of the high ceilings, amber walls and fresco’s as you enjoy some well-earned beer- and if you like it enough you can even stay for a meal! Must Try Dish: Keeping up with Bavarian history, try out the Hofbräu Dark Beer, the original Bavarian beer and first work of Wilhelm V, a tasty dark-coloured beer. 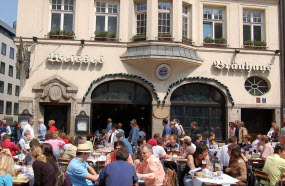 The Hofbräukeller is the perfect place to combine both culture and history – this used to be one of the NSDAP (Nazi Party)’s favorite places to enjoy a beer after work. 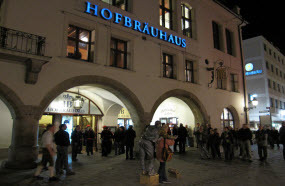 Today the Hofbräukeller is the perfect mix of classy and relaxed, whilst respecting the traditional building and culture. You’ll have the perfect opportunity to wave to your friends and family on the other side of the world from the live webcam in the beer garden. Must Try Drink: For the best chances of a great beer, ask the wait staff for the Seasonal Beer. This will ensure your beer is fresh and of highest quality. 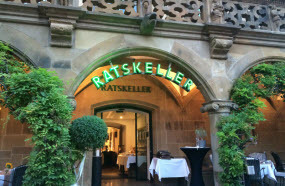 The Augustiner Keller is one of Munich’s most popular beer gardens (with inside seating also available). Relax in a traditional building with wooden ceilings and hand-crafted seating. Come and enjoy some beer, or food, and watch your favorite sport on the television. Check their website to see which games are being played.To maximize your visit, come during Oktoberfest. Must Try Drink: We suggest try the non-alcoholic beer, Claushaler. With so many other beer gardens in Munich to visit, a non-alcoholic beer will be the perfect break – and you can even drink it in the morning without feeling guilty!